The first Seaview Mermaids were designed in 1907 by G.U. Laws from Burnham. 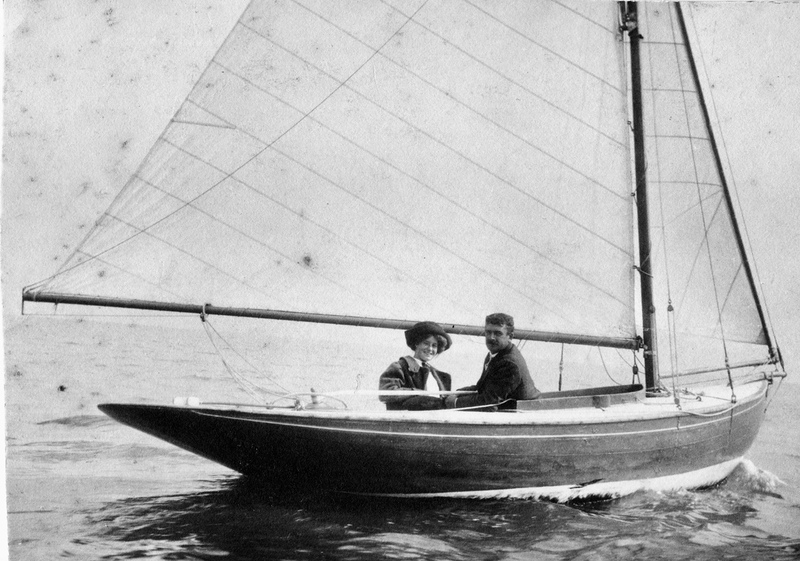 Laws went on to win the gold medal in the 1908 London Olympics in a 6 metre yacht that he designed, built and helmed, an achievement that has never been repeated. Whilst the two events may not be directly connected, the racing pedigree of these early Mermaids cannot be in doubt. Gaff-rigged, bowsprit, spoon bow and a long boom, their slim lines and long counter represent the peak of Edwardian yacht design and development. With exceptional speed and superb sea-keeping, the first Mermaids gave the club modern racing. The evolution of the Sea View yacht club owes much to this early design. It is believed that there were 8 yachts built between 1907 and 1910 at the famous Woodnutts yard, St Helens Duver. Curiously, the yachts were not built as a one design. They differed from each other in scantlings, weight and sail plan. 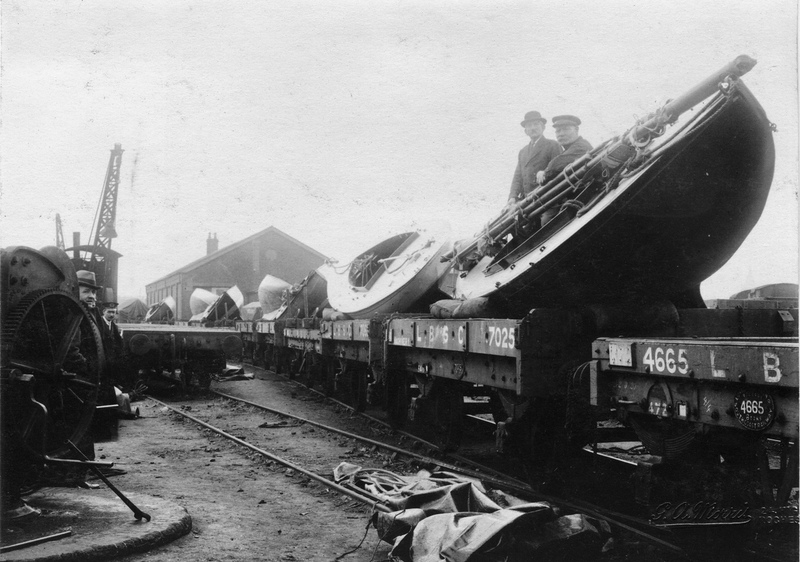 The Great War and its unprecedented destruction of young life brought Edwardian yachting to an end. However, by the beginning of the 1920s, the members of the club began to think about replacing the 1907 design with a more modern boat. In October 1921, the members of the Medway Yacht Club agreed to purchase 7 Mermaids for the not inconsiderable sum of £630. Lily (No.1), Halluf II (No.2), Scuttle (No.3), Violeta (No.5), Naomi (No.6), Mimosa (No.7) and Seamew (No.8) were sailed to Portsmouth loaded onto open wagons and taken to Kent, where they re-named and raced until 1949 as the Jewel Class. The photograph below shows the Mermaids on arrival in Rochester. There are two 1907 designs owned by members of the club. One is the original Halluf II (green topsides). The other is a 1994-build called Mizpah (white topsides), the photograph below shows both yachts racing off Yarmouth in the June 2006 OGA race. Halluf II is not only distinguished by her pedigree. She also has a distinguished racing record. Although after 1949, when the Jewel class was discontinued, she deteriorated, she was purchased in the 1970s by Gayle Heard, the well known East Coast sail-maker and yachtsman (his father was the distinguished J-Class captain), restored and raced. Her record was superb. She trounced all the East Coast gaffers, so much so that they banned her from racing with them. Forced to race against the Bermudan rigged classics, she trounced them too. By 1997 she was again in a sorry state. Fortunately for the club, she was found by N Lykiardopulo Esq., returned to the Isle of Wight and restored. Her racing success continues. The photograph above was taken the day before she won outright the Queen's Jubilee race at Yarmouth. Mizpah has also enjoyed racing success. She has won the Round the Island race Jubilee Trophy for classic gaffers on four successive occasions (2001 to 2004); she raced successfully in Falmouth week winning 3 of the 5 races and coming second in two, ending up as overall winner; she has won numerous class races at the Old Gaffers festival in Yarmouth as well as the Otter Cup in 2006. The 1907 Mermaid was replaced by the 1922 Bermudan design of Alfred Westmacott, a renowned yachtsman and naval architect who lived in St Helens. There are two 1922 Mermaids still sailing, Zara (light blue topsides) and Zircon (pale yellow topsides). Both raced in the recent centenary celebrations.